We are constantly updating content on this page. The purpose of the orchard is to help provide produce for the free meals project at Dumfries North West Church. The orchard will enhance the natural beauty of Lincluden Abbey and be an asset to local people and tourists alike. There will also be a Centenary Field to commemorate the 100th anniversary of World War One, and poppies will be planted in the spring of 2015. Jo and I were gutted when we heard about the vandalism to the art work on Terregles Street, especially as we have just raised a further £500 (through the "Bustin a Gut" challenge) to extend the murals in the Palmerston Arena. 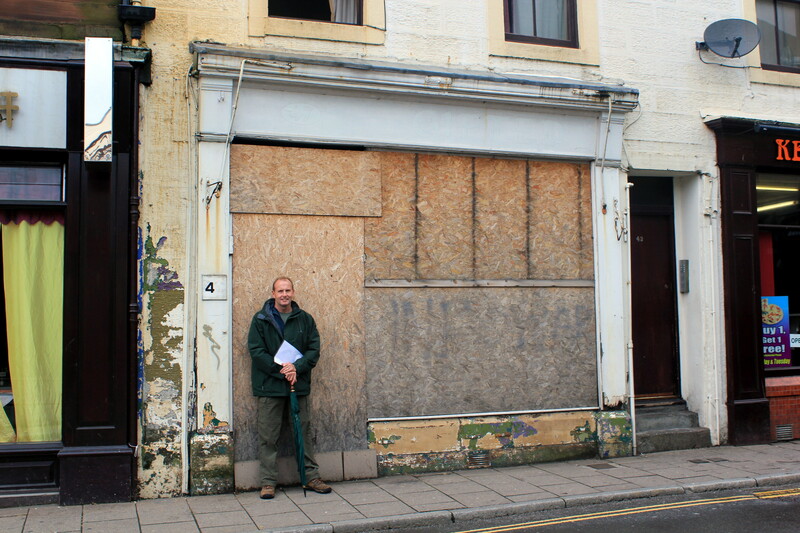 Only three days before the vandal attack, a new picture of Billy Houliston was unveiled next to the shop. We have however been amazed at the fantastic offers of assistance to help protect and preserve the murals. In particular Davy Walls and Ross Corbett have been brilliant. Could you fit some white lights above your door or window, along your wall, or draped in a tree? If you can, then you could help Dumfries and Galloway in its quest for a winter light festival. This is not about the council doing something, this is about you as a person making a difference to your community by transforming your property at what is a very dull time of year. We are not asking you to throw a bucket of freezing water over yourself, in a challenge that will last seconds, we are asking you to affix some white lights for the entire winter season, for the benefit of you and everyone who comes to visit Dumfries and Galloway. Together let's transform our town and light up our lives. We’ve all heard about neck-nomination, but as this is Easter let’s transform this controversial craze into something positive. It’s time to get Egg cited for Egg nomination! The principle behind the idea is to be a ‘cracking’ good citizen by giving a little of your time to benefit others. 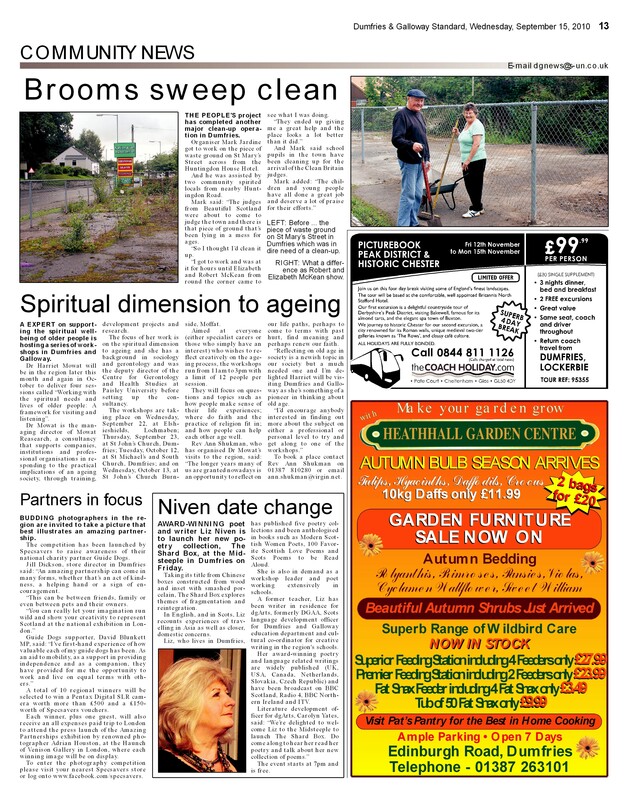 This could be for egg –xample, through helping in your community by tidying streets, clearing beaches, planting trees or flowers, helping elderly neighbours with their gardens by cutting grass or painting fences, - the list is endless. Or you could simply donate some money or Easter eggs to charity to benefit those living in difficult circumstances this spring. After doing your Egg nomination, post a video or picture on Facebook at www.facebook.com/peoplesprojectdumfries to show others the value of what you’ve done for society, but then egg on your friends by nominating them to play their part in being egg- ceptional and helping others. Everybody can be Good and Generous this Easter! Let’s have great egg-spectations this Easter and come up with some egg-splosively good deeds! Make your nomination as egg-stravagant and as egg-streme as you wish, while egg-sploring and eggs-pressing your good nature! Go the egg-stra mile, beat the scramble and get nominating. All yolks aside though, this is s great opportunity for you to help those less fortunate than yourself and give something back to your community this Easter. So come out of your shell, and don’t be a rotten egg, - we don’t mind if you poach the best ideas for your egg nomination. It’s an egg-cellent idea, - who are you going to EGG-NOMINATE? The People's Project are pressing ahead with the Palmerston paintings which will take 12 -18 months to complete. Local stonemason David Little is working hard on the finishing touches to teh Queens Diamond Jubilee sculpture which will be placed at St. Michael's Church. After years of planning the People's Project at last got permission to place signs on bins and bus shelters encouraging people not to litter, drop chewing gum or cigarrette ends and to clean up after their dogs. Pretty simple concepts in the big scheme of things, but quite radical if they prove a success! Morrisons roundabout has been totally revamped, - and a stunning painting of Robert the Bruce was erected at the entrance to Castledykes Park at the beginning of August. The People's Project commissioned local artist Jo McSkimming to give one of Dumfries' biggest eye-sores a face lift. 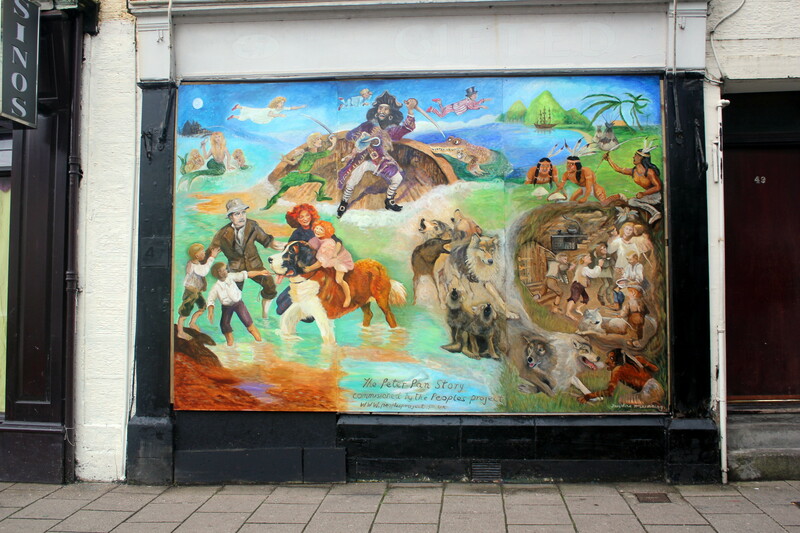 The shop on English Street in Dumfries had been boarded up for 5 years and looked hideous;- we have now created the Peter Pan story in pictures - see below or go an have a look for yourself! 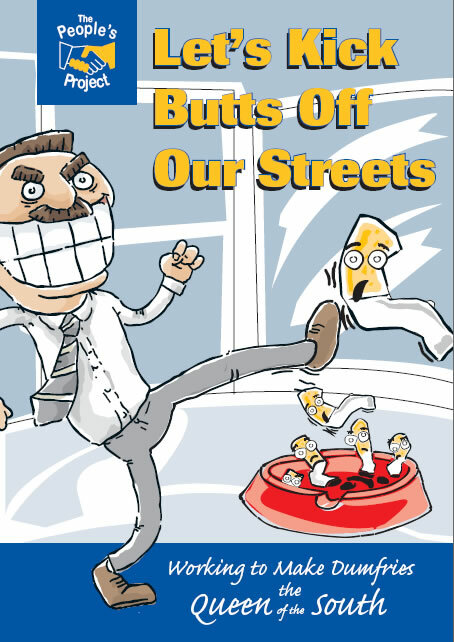 The PP is working very hard on a number of initiatives with the council, - including the sponsoring of roundabouts. Our "Must See's and Do's in D&G" are now available from a number of tourist outlets, -if you would like one or a supply for your own tourist outlet, - please drop me an email, - thanks. Local artist Jo McSkimming will produce a series of 12 large paintings which will fit in each of the frames in the brickwork on the wall of the Terregles Street end of Palmerston. After discussion with the Board of Directors it was considered that a mix of QOS legends and Dumfries legends would be best. How about a zip wire across the Nith, - or a tall ship berthed on the Whitesands? Why can't we have a Peter Pan trail, - or what about an indoor football facility at the Loreburn Hall? 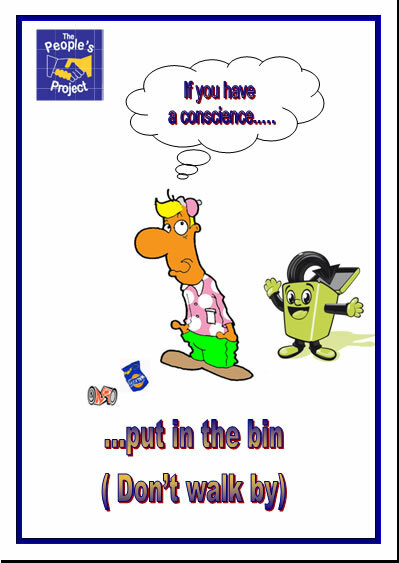 The People's project have opened a dialogue with the police and we hope to be able to persuade the powers that be to include littering and dog fouling to anti-social behaviour, - allowing police officers to hand out fines. "The One Show" on BBC 1 featured our statue in a row with Kirriemuir over the true birth-place of Peter Pan, on Wednesday August 17th, 2011 - recorded on BBC Iplayer. Grateful thanks are extended to the management and staff at Garden Wise, Ineke Thomson and her dancers, - to Claire Hastings and everyone else who helped out behind the scenes to make this event so successful. New Abbey won a silver award and Dumfries "best large town" in last summers "Beautiful Scotland" competition, - and we hope the recognition will bring extra visitors to the region. The People's Project worked with Story Homes and Tam Pott's, - a local dyker, -to rebuild the dry-stane dyke at The Stoop, - which had been gradually knocked down over the last 4 years. Tam was absolutely brilliant with the kids, - showing them in small groups, - how to build a dry-stane dyke. This unique initiative brought new skills to some youngsters, and the kids from The High School have taken "ownership" of the wall. Thanks too to the teachers from the High School, - who had to brave monsoon conditions! 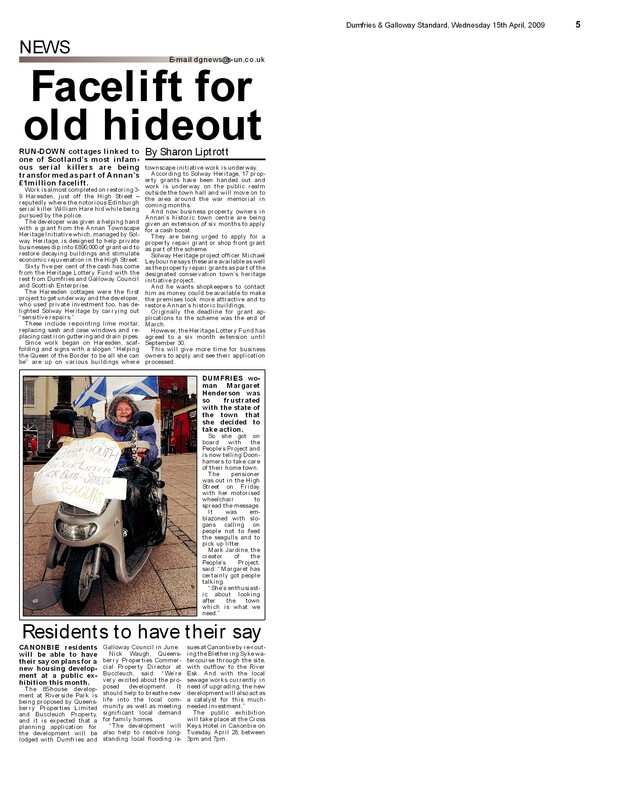 Yes the People's Project submitted a bid for city status for Dumfries in the Queens Jubilee year, - but it did so in good faith, - which caused a bit of a furore, - to say the least. 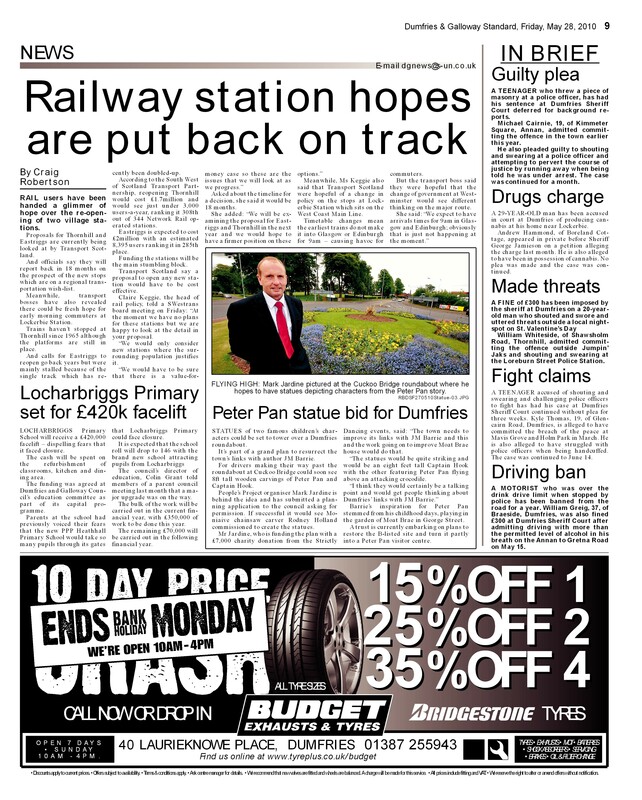 Without intending to cause embarrasment to anyone in the council, - we were completely taken aback when news was released on Thursday 16th June, - that Dumfries was on the list of candidate towns. Unfortunately, - all bids have to be made by a council, - and given that at the 12th hour this couldn't be done, - we submitted the bid independently. All things being equal, - The People's Project believes that Dumfries should be granted city status, - therefore becoming Scotland's First City, - and the brightest jewel in her Majesty's crown. The People's Project completed two fantastic litter picks with local schools, - the first organised by the teachers of New Abbey Primary, - and the second in conjunction with Dumfries High School in their 50th anniversary year. A BIG thankyou to all teachers and pupils involved! Did you know that the town of Dumfries itself has 4 golf courses and 2 golf ranges? "DG LIFE" MAGAZINE - who on page nine of the March issue, - included an article on the People's Project Lottery. The magazine also distributed FREE - copies of the lottery leaflet. 80% of any revenue received through the lottery will be given to the SOS Fund to help Queen of the South in 2011! All you need to do, - is click on the lottery section and follow the details, - or even more directly via www.unitylottery.co.uk, - type in the people's project, - and you can pay by means of a range of cards. A moment white, - then gone forever." "If Burns were alive today, - he would think of Queen of the South as a snow-flake, - a real -life star, - to be coveted like a precious jewel. All those who love Queens will need to steer that snow-flake away from the river, - so it builds a strong foundation, - and lives forever." We all have a civic duty to clear our paths, - pavements, shop-fronts and ultimately our roads of snow. Imagine the scenario, - 6 inches of snow falls overnight, - yet we all jump into our cars wearing high heels, - and that's just the men! Instead, - every able bodied person should do their bit prior to jumping into that warm cocoon - and ONLY then if the road is passable. Instead of passing the buck - spend 20 minutes or more to make sure you and others will be safe BEFORE you set off. While all this is happening, - the council should be attending to the main roads, - and everyone will live happily ever after. Alternatively, - you could spend umpteeen hours freezing in a tin can! The People's Project considers it imperative that the Theatre is saved in some guise at least. It accepts the limitations of the theatre, - but believes it has a future, - perhaps as a restaurant/come visitor centre, - highlighting the town's connections with Burns, Bruce and Barrie. Perhaps it could be renamed the Peter Pan Theatre, - providing workshops for schools and other groups? In tandem, - those with a vested interest in the theatre need to embrace the possibility of a new, - state of the art facility being created in Dumfries, bringing top acts and many visitors to this unique corner of the world. The People's Project have teamed up with local Eco-schools co-ordinator Liz Gumby to produce a callendar for 2011, - which has been designed by pupils from Maxwelltown High School and St. Joseph's College. The theme of the calander is pupils against litter and some fantastic designs have been created, - including some litter pigs, - produced by Maxwelltown High, - and a wonderful spin on the X Factor by St. Joseph's. The People's Project have donated £500.00 to the Summerhill Community Group who have done some sterling work over the last few years through the strong leadership of AnneMarie Coulter. The People's Project were the main sponsors of this years fireworks display at Park Farm, (organsied by the local Devorgilla Rotary Club)- which was yet again a phemomenal display. A tremendous effort from Devorgilla Rotary Club and a number of other charitable groups, - businesses and individuals in ensuring the success of the event, in what was a real people's project! 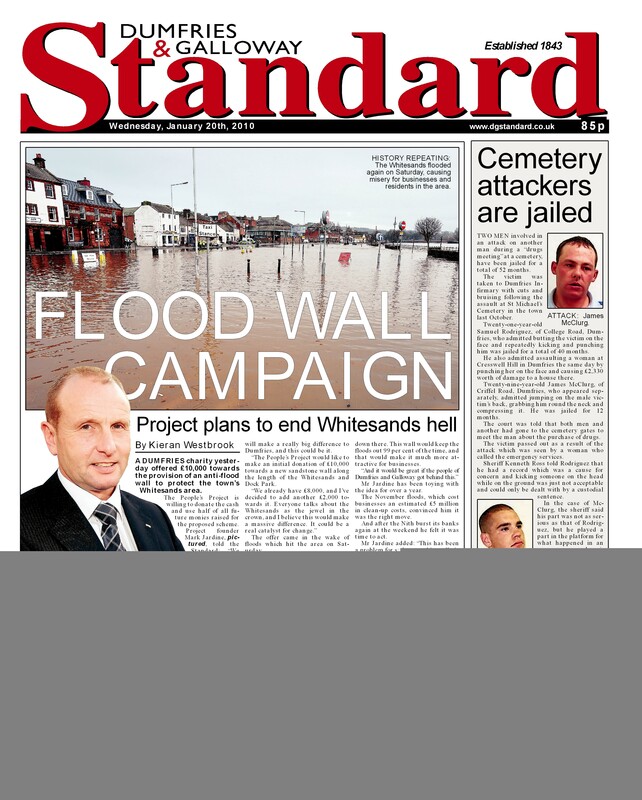 As we enter the rainy season in Dumfries and Galloway, - the People's Project once again calls for a simple flood wall to be erected on the Whitesands to prevent the perennial problem of flooding in our regional capital. 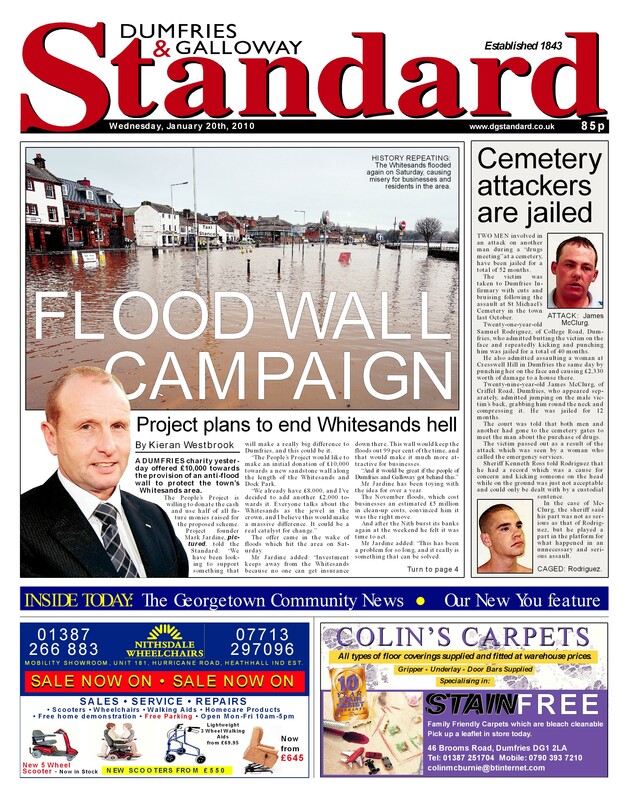 As the article from "The Standard" in January suggests, - the PP is willing to put up an initial £10 000 to kick-start the project, ( £8K from the PP bank account and a further £2k from myself) - with the most straight forward of suggestions, - simply place a sandstone block on top of the existing wall and block off the sandy opening, - and 99% of the flooding problem will be solved! Doing nothing has not worked, - spending millions of pounds is not an option, - so why not employ a couple of tradesmen, - remove a section of fence every day with a disc cutter, - bed the new sandstone coping stone, - and refix the fence when set? Yes there will be some displacement, - but let's deal with that problem as and when it happens! Why not involve students from D&G College to help with the job to make it a real People's Project, - and when it successfully holds back the Nith, - then inward investment, instead of dirty water will flood in to the Whitesands, - the jewel in the crown of our regional capital. Dumfries won a coveted silver gilt award in the large town category of the above competition in Glenrothes on the 22nd of September 2010, - coming second to the hosts. 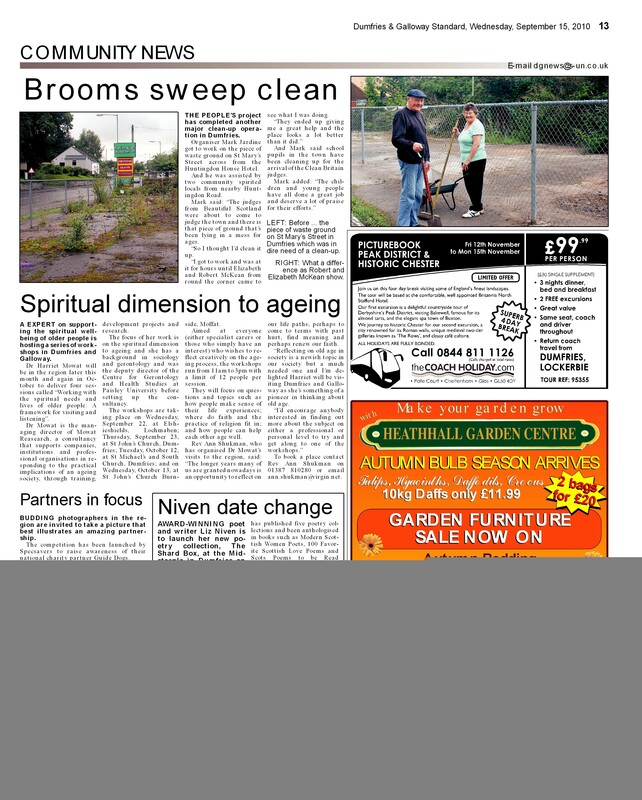 The judges awarded the town 160 points out of a possible 200, in a range of areas from cleanliness to biodiversity, - and from lack of graffiti to the number of hanging baskets. 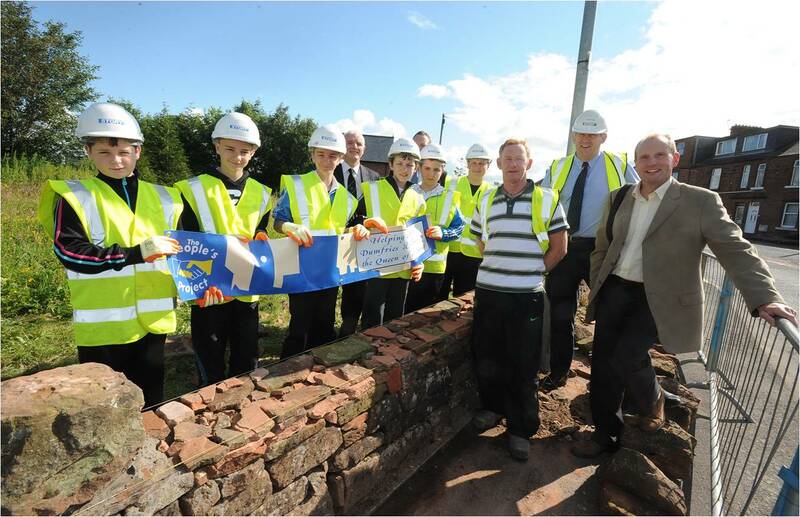 The People's Project would like to thank Civic Pride - Dumfres and Galloway Council- the education department - the Dumfries and Galloway Standard and all businesses and householders for taking part in a real people's project. The People's Project vehemently opposes the proposed extension by "E-ON" of the wind-farm in the Solway, - as this will impact severely on the communites of Rockcliffe and Kippford. The villages are in an area of outstanding natural beauty, - and attract visitors from all over the world, - who come to marvel at the sea-scape. Sadly, - those numbers may reduce drastically ,- if this extension goes ahead - at a time when Dumfries and Galloway needs all the visitors it can get! Everyone who opposes the extension should join the People's Project to keep "E-ON" out! Once again the People's Project calls for a bye-law to prevent people feeding sea-gulls in Dumfries. By feeding the birds and leaving litter simply attracts the gulls, - and people should try everything in their power to get rid of them. If we all ensure that there is no litter lying around (and hence no food source) the birds will fly away to find a new supply. So simple, - yet so effective! Letters have gone out to all schools in Dumfries, - asking pupils to form an army to help make Dumfries the cleanest town in the UK. Colin Grant, - the director of education has given his backing to the campaign, -but we are under no illusion that this will be an overnight success. 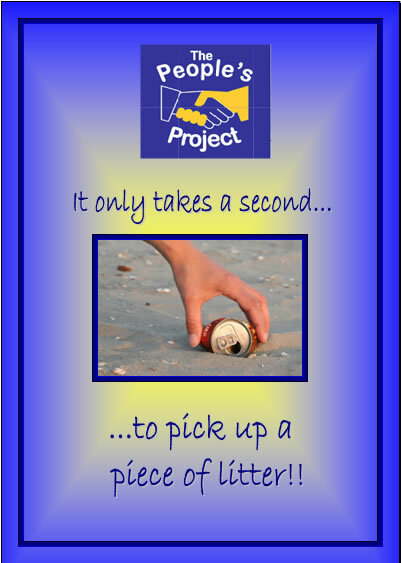 IT ONLY TAKES A SECOND TO PICK UP ONE PIECE OF LITTER! Please wait while the video below loads - courtesy of Purple Box Productions. You can also download a higher quality version of the file by clicking the link below the video.